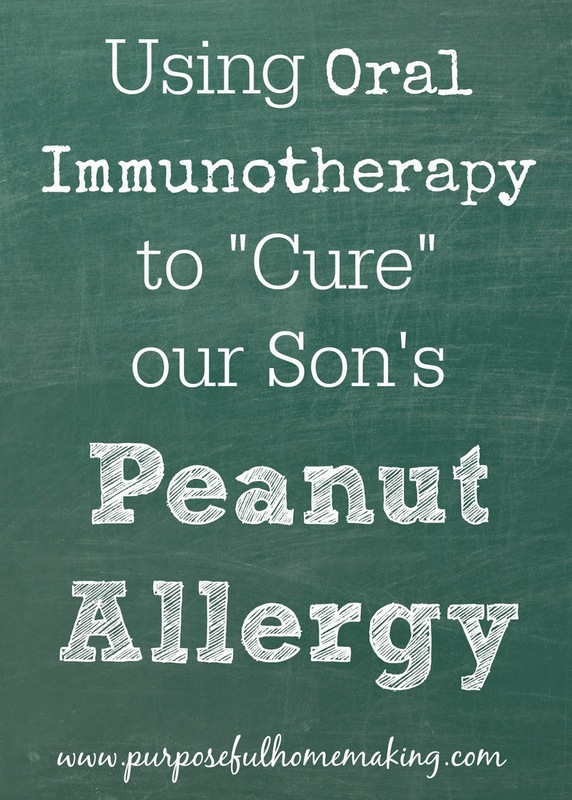 Last week we started Oral Immunotherapy for our son's peanut allergy and I thought it might be helpful to another mom who might be out there Googling "how to cure my child's peanut allergy" if I shared our experience with you. His first reaction to peanuts was when he was 9 months old and accidentally touched his cousin's peanut butter and jelly sandwich. Thankfully his reaction was mild and he only broke out in hives around his mouth. We were on a family vacation with my husband's family and were out in the middle of nowhere so looking back, I thank God for protecting our son. The third reaction was last Easter when we went to my husband's grandma's house. There were peanut M&M's on the table where we were sitting and, while I felt nervous, I didn't want to overreact and make a big deal about them being there. I figured that since he wasn't touching them or eating them, he would be fine. And yet, within 15 minutes he broke out in hives. I quickly got the peanut M&M's out of the room and after about 20 minutes the hives went away. I have to admit, prior to this, I wasn't the most vigilant mother about possible peanut exposure. Sure, I stayed away from the obvious, but prior to his last two appointments I kept hoping and praying he would outgrow the allergy and I really wasn't stressed about accidental exposure at potlucks and birthday parties. Of course, ever since we found out that he was allergic to peanuts (as well as a few other allergens) I began praying for his healing. Nothing is too hard for the God who created the universe out of nothing and I don't believe peanut allergy is beyond His scope. However, sometimes God chooses to heal by directing our paths to solutions rather than outright healing. I'm not sure why, but I'm guessing that maybe He has people He wants us to impact. But then one day, God providentially had my sister share an article about OIT on Facebook. I "happened" to read the article and at the very end noticed that it was about a family who saw a doctor about 45 minutes away from us. Initial dosing and subsequent up dosing is always done in a doctor's office. Daily doses are given at home. Our amazing and incredible doctor also happens to be a pediatrician which feels like a bonus to me. Our first day could have taken up to 8 hours. Unfortunately, our son only made it 5 1/2 hours before he had his first reaction. It was mild, but showed up within minutes of the last up dose. His doctor doesn't believe in pushing past mild signs because, obviously, it's not worth it to have a serious reaction. On our first day, our son made it through several levels before I noticed a red spot next to his mouth after the last up dose and realized it was a hive. His doctor said we were done dosing for the day and then continued to monitor him for an hour after that. Prior to the hive, our son received a dose of peanut flour in a liquid form every 15 minutes. His first dose was 1.025 micrograms. Each dose was given two times, 15 minutes apart. If he did not react at all, he could proceed to the next dose. He reacted when he got to 410 micrograms so we were sent home with our own bottle of peanut protein already in a liquid form with dosing at 205 micrograms. I give him a 2 ml dose of 205 micrograms of peanut protein twice a day, twelve hours apart. We need to stick as closely to this time frame as possible as it is "the sweet spot." However, we do have a 3 hour window either side of the 12 hours if necessary. After each dosing, our son is not to let his heart rate increase for 2 hours afterwards so as to avoid any serious reactions such as anaphylaxis. The second dose of the day is to be given one hour before bedtime so that he can be monitored for reactions. I know that might sound like a lot to deal with, but most of this is temporary and if it frees our son from his peanut allergy it is definitely worth it. In fact, we were out of town for 3 days just after starting treatment and it wasn't a big deal at all to stay on track with his dosing. If our son tolerates his dosing at home, we can go weekly for up dosing. If he is having reactions to the current level, the doctor will either lower his dose, or he we will continue on the current dosing for longer and try again in a week or so. Our doctor keeps reminding us, this is a journey, not a race. Everyone responds differently and because of that, we don't have an end date in view. Since our son didn't get as far as we would have liked him to on that first day, he will have 4-5 weeks added on to the entire treatment. If I had to guess, I'd say we're talking around 7 months of weekly visits to the doctor's to increase dosing. In order to graduate from OIT, our son will need to pass a peanut challenge which involves eating 24 peanuts in one sitting. 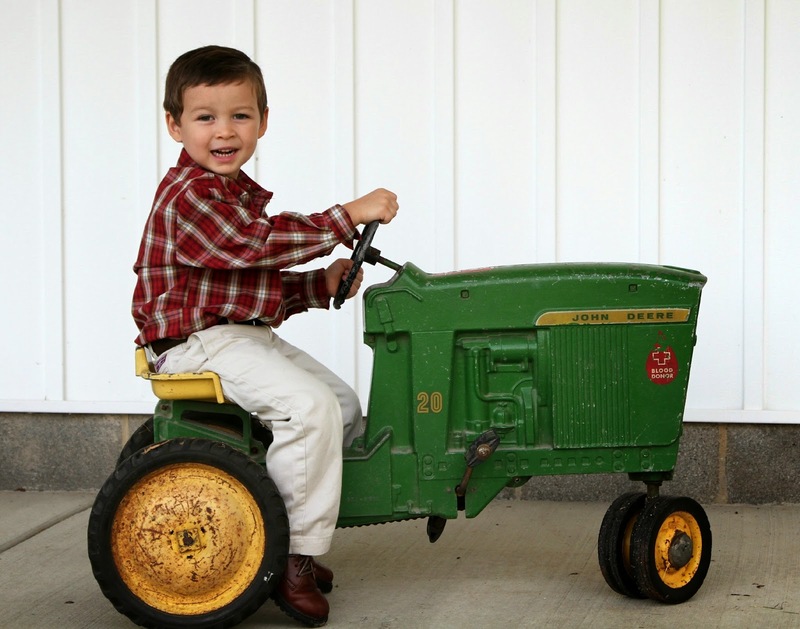 This is incredible to me that other children are able to do this, and oh how I pray that will be our son one day! It is beyond me to even comprehend that he will be able to do that, Lord-willing. Of course, it is a long process getting to that point, but it can be done. If you're considering Oral Immunotherapy (OIT) you may have a lot of questions. I know I did, so here are some that I had. I hope they will help you make a decision to see if this is right for your child. My child has a severe allergy. Is he a candidate for OIT? Yes, our son has even had an airborne reaction to peanuts and that was my concern too. If he can't even sit by peanuts, how on earth can he ingest even the tiniest microgram? People with a severe allergy are the best candidates for this program because their allergy is life threatening. They can be younger than 4, but our doctor prefers they be at least 4 or 5 so they can communicate to you regarding any symptoms they may be having. Our son is 4 1/2. The national average is 85% and our doctor has a personal success rate of 92%. After OIT will my child just be safe from cross contamination or will my child actually be able to eat peanuts? Once a child has passed the peanut challenge they can eat peanuts as much as they would like to. Which protocol does your doctor use? Our doctor uses Dr. Wasserman, MD, PhD's protocol. Dr. Wasserman has treated patients with OIT for over 5 years and over 100 patients. Is someone truly cured of peanut allergy? Technically, no, but they are desensitized and can eat as many peanuts as they want once they graduate from the program. It will still be necessary to carry an epi pen. How long will daily maintenance doses need to be taken? At this point, daily maintenance is life long. However, after several months of completing the program, dosing can go down to once a day instead of twice a day. Here is a helpful video that shows you the start to finish of OIT treating peanut allergy. Obviously, we're not at the end of this immunotherapy journey and I'm praying that peanut allergy will be a thing of the past when this is all said and done, but that's still a walk of faith for us. However, pursuing this is much more hopeful than the last allergy doctor I went to who never even mentioned this option. I left with a script for epi pens and the fear put in my heart that I had better be very careful what I let my son not only eat, but get near. That is a tall order, especially when you would love for your child to live without the fear of accidentally eating something lethal (or at the very least, landing him an unpleasant trip in the ER). So, we are beginning this journey with Oral Immunotherapy. My goal is to blog about our experience with it in order to help and encourage other moms. I would love for you to follow along with us. The prayers of friends and family have been so encouraging and God's grace has been evidenced thus far. A few more questions for you Backy! Can adults do this? I can't be in the same room as peanuts or I start having trouble breathing, etc... Very interested in this! . I haven't eaten out of food prepared anyone else in over 8 years because of fear of another anaphylactic reaction. Yes, Karen! I can give you our doctor's contact info. He is fabulous and an answer to our prayers. PM so I don't forget. We have a showing in a couple minutes so I need to scoot! :) He does other things too like milk, tree nuts, but only one at a time. Almond is next for Caleb Lord-willing! Thanks for sharing. We were diagnosed about 18mos ago. We also are allergic to almonds, eggs and dairy. I am still hoping to outgrow my sons allergies, but if not we will be "of age" in two years to try OIT. Wishing you the best of luck! You're welcome Leslie. I hope there is a doctor near you should you need to pursue OIT in the future. OIT is helpful for tree nuts and dairy as well (maybe more?). 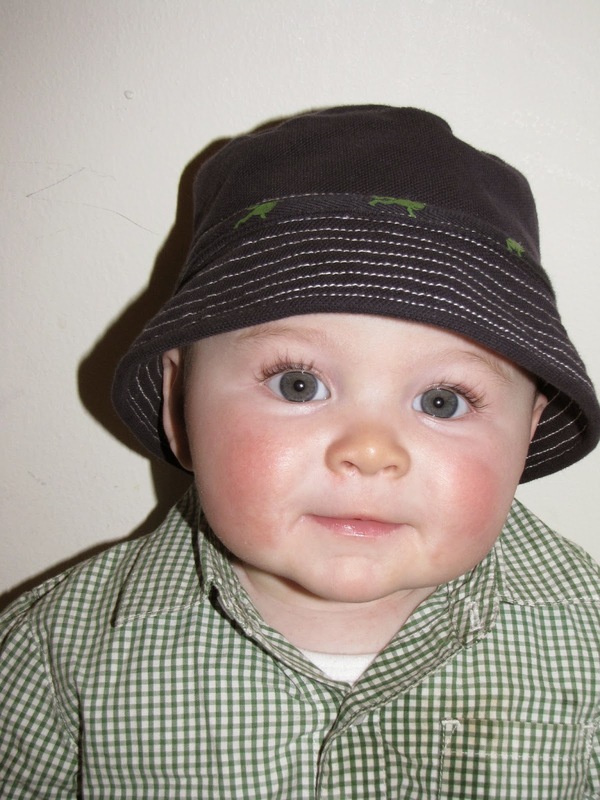 Our son has also been allergic to eggs and dairy in addition to sesame, brazil nut and of course almonds and peanuts. He outgrew the brazil nut allergy, but still struggles with dairy (although it seems to be more of an intolerance now than an allergy). We will work on the almond allergy after we get through this. One thing at a time though. :) Thanks for reading the post. I appreciate it! Was your insurance cooperative in providing OIT?